Magento is very popular and certainly one of the most developed platforms for running an online shopping cart. 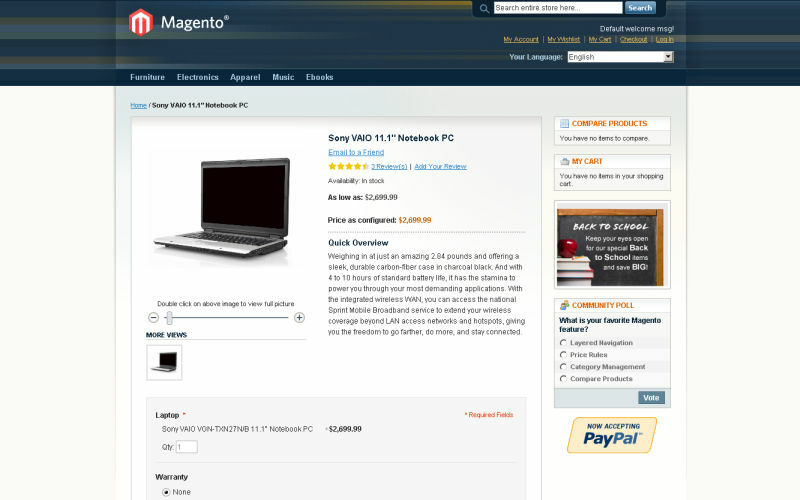 Magento is famous for the number of functionalities it offers. Everyone knows about its extensive analysis, report and product management systems, mobile version or the payments system. 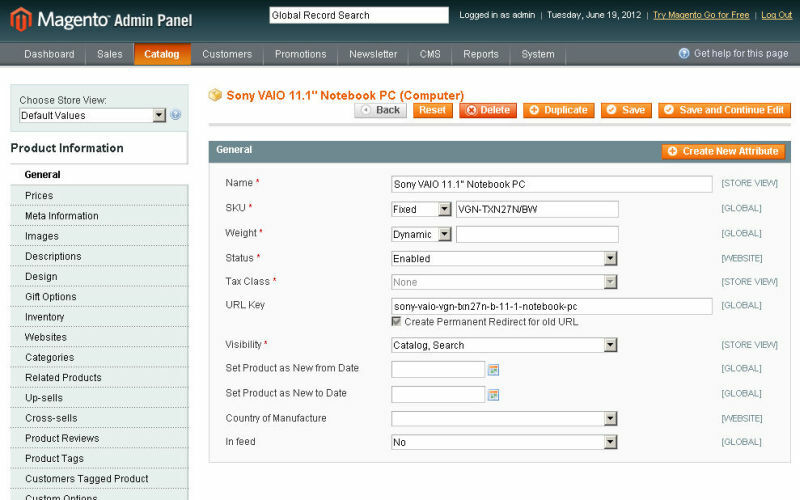 It's interesting how the script allows for running several stores at one time from one administration panel. Another example of Magneto's extraordinary capabilities is the ability to set a template for a given product that will make this product to present to a client differently than other products at the same time period. You can't have a good support without a large community of users who, among others, contrubute to discussion boards. Suffice to say, Magento's technical support is very good. There are scritps that can lead a programmer developing it to a dead end. Limited capabilities of the script won't allow for creating advanced websites. This is not the case with Magento. Although the PHP code is extensive, carefully thought out architecture allows for practically unlimited expansion capabilities. The script features many built-in functionalities, but still there are plenty additional ones that can be installed in Magento. Many of those are professionally written, but they are also chargable. 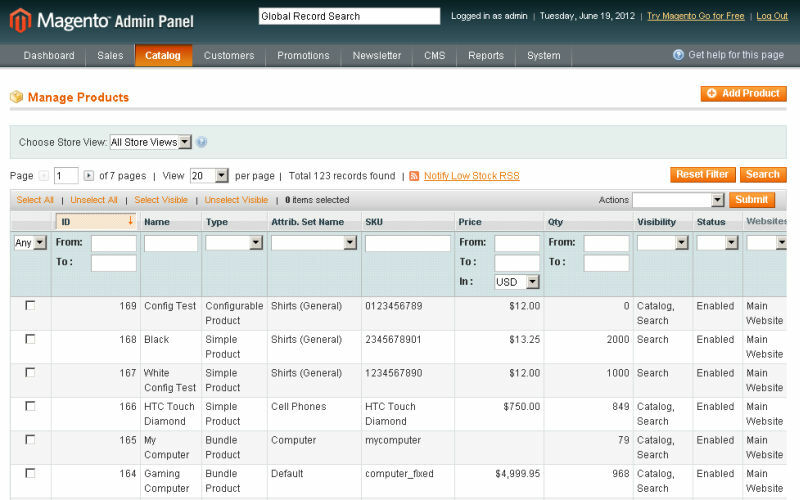 It's worth noticing that there is a more developed paid version of Magento (that grants access to a high priority tech support), but still the free version is loaded with lots of functionalities to begin with. The script code has a big SEO potential. Very few of the free online shopping cart scritps are written with such consideration for those optimizing the code this way. Modularity and expandability unfortunately often mean high demands on server parameters. This is the case. Not many servers can manage this platform. The list of hosting companies that can accommodate for the script's needs will be a lot shorter than in case of the other online stores. Even simple administration tasks like adding a new product may not be as straightforward as in other scripts, e.g. Quick.Cart. Learning its functionalities takes a lot of time and sometimes even takes tutoring from a system's expert. The script is not very user friendly and requires an experienced programmer to modify it. Quick.Cart and PrestaShop are much simpler in use and making changes, but they don't offer as great abundance of functionalities as Magento. Magento is a very ample script. Its architecture and capabilites is unmatched by many other free scripts. It is unfotunately also marked by low efficiency and high server demands. Choosing to start a business with this platform you have to consider that not just any programmer will be able to manage it and not just any server will be able to accommodate it, what could mean bigger expenses. We strongly advise to seriously consider using other applications if you're planning on having a small shop with not very big needs. By far the worst framework I've ever worked with. Extremely sluggish, overly complicated and full of boilerplate code "just because", in the name of a flexibility that 99% of User will never need. Developing even the simplest module for it requires hours, if not days of work, and most configuration errors result in a whole module being ignored, without messages or hints of sort. Magento is the perfect example of speculative generalisation, great in theory, but absolutely rubbish in the real world. I strongly recommend to look elsewhere if you need a product that "just works" like: Prestashop, VirtueMart or Quick.CART. platforms for running an online shopping cart. The script is for create a large e-store with many functionalists able to manage large number of products. Doesn't offer in depth Official support for the free & paid edition also. As a programmer I don't recommend it. Terribly extensive engine, where 95% of modules and options are unnecessary for most shops. Incredible implementation costs, server technical requirements are simply exaggerated for most shops and their needs. Yes, some day some of the options may be useful, but somehow it doesn't convince me. Disadvantages: Impossible for me to update. Very Steep learning curve. Takes forever and a day to make minor modifications. Sluggish. For me as a beginner i would go to Opencart, cause it suits my needs and easy to use when it terms to features, i don’t have much knowledge of programming, but can manage to set up my own online store. Magento is to hard for me.